We’d love your help. Let us know what’s wrong with this preview of If Everyone Knew Every Plant and Tree by Julia C. Johnston. Oliver Campbell, fourteen, fanciful and funny in equal measure, struggles to unravel the knots of emotion when his little sister, Lily, falls gravely ill with a mysterious disease. Irritating and puzzling to his two older half-brothers, neglected by his self-absorbed mum and dad, and unfalleninlovewith by Poppy Teasdale, he longs to be s Ollie is drowning. No one notices. Quirky Kamal doesn't think it's weird that Ollie, his best friend, is fascinated by words and plants; he knows what it's like to be different and to be bullied; he coaches him on love, and how to clinch his dream-girl; he tickles him with his highfalutin language and aspirations; he impresses him with his fortitude despite a tragic past; he is there when his life takes a terrible turn; he is loyal to the end. Ollie's two special people throw him life jackets, but will they be enough to save him...? To ask other readers questions about If Everyone Knew Every Plant and Tree, please sign up. Entertainment of the highest form! Not being an avid reader, but so baffled by my son being engrossed in a book for the first time, I needed to find out what form of magic was entrancing him. It became clear after practically the first line. It was a rare treat to discover this gem of a novel written in such an engaging style that I did the equivalent of falling in love I reckon. I thought it was for teens, but I’d say it’s for everybody. The author has an unusual skill of reaching everybody, li Entertainment of the highest form! Not being an avid reader, but so baffled by my son being engrossed in a book for the first time, I needed to find out what form of magic was entrancing him. It became clear after practically the first line. It was a rare treat to discover this gem of a novel written in such an engaging style that I did the equivalent of falling in love I reckon. I thought it was for teens, but I’d say it’s for everybody. The author has an unusual skill of reaching everybody, like Catcher in the Rye maybe. I even learned stuff about Shakespeare, poetry, art, and plants but the main thing is, I couldn’t stop thinking about the story and what was going to happen to Ollie and Lily. Would he get together with Poppy? Would he be sent away? Would Lily get well? What was Kamal’s secret past? I have read the quirky ‘The Curious Incident of the Dog in the Night time’ and it reminded me a bit of that but I would actually say it’s better and that more happens. Even though the most powerful feelings it evoked were longing and regret, the writing is so goddam FUNNY! Intelligence, charm, quirky language, culture, poetry, wit and perhaps overall, compassion, comes out from every page. I will keep going back to this book like a favourite film. In fact, it would make an amazing film. I bet it will end up as one and if it does, the author should write the screen play as her clever knack with dialogue is an absolute delight. 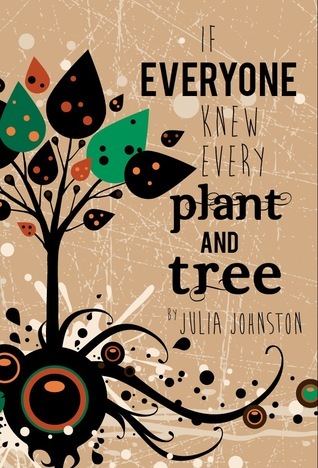 "If Everyone Knew Every Plant and Tree" by Julia Johnston which I won through Goodreads Giveaways is a warm, touching, and beautifully crafted story , a strong blend of laughter and heartbreak. It begins when Lily, the sister of shy fourteen year old Oliver (Ollie) Campbell is stricken with a mysterious disease and rushed to Newcastle Infirmary. As the days pass and his parents become distant, absorbed in Lily's recovery, Oliver feels torn between his love for his little sister wanting her home "If Everyone Knew Every Plant and Tree" by Julia Johnston which I won through Goodreads Giveaways is a warm, touching, and beautifully crafted story , a strong blend of laughter and heartbreak. It begins when Lily, the sister of shy fourteen year old Oliver (Ollie) Campbell is stricken with a mysterious disease and rushed to Newcastle Infirmary. As the days pass and his parents become distant, absorbed in Lily's recovery, Oliver feels torn between his love for his little sister wanting her home and well, and angry at his parents neglect. When he turns to his older brothers for support, Ollie finds Nathan has become angry and aloof, drowning his sorrow in his skateboarding, while Sam immerses himself in his studies. Looking for some sort of balance to his emotional upheaval, he turns to his best friend Kamal and Poppy Teasdale, the girl he has a crush on, but these two may not be enough to help him through the crisis. The plot is well-written and told from Ollie's perspective as Julia Johnston sets the stage with Lily's debilitating illness that continues to be undiagnosed. As Ollie grapples with his feelings of anger, frustration and powerlessness to help his beloved sister, he becomes aloof from his mother who's devoted to her daughter, to the exclusion of her three sons. With clever dexterity Julia Johnston weaves together threads of a story that look not only at the impact of the illness on Lily, the strain on the family and their disengagement with each other , but also Ollie's struggle to keep from drowning under the weight of his emotions. I loved the way the author tied Ollie's use of Latin names of plants and trees to his feelings as well as employing their textures,colours and smells to infuse a soothing balm to Ollie and his father's broken hearts. Even Nurse Celia's letters to her Mam lighten the intensity of the atmosphere with an update on the situation and a sense of her family's normalcy. With her last letter, and Thomas Diamond's there's an awareness that life goes on even after death. The characters like the plot are well-developed, and unforgettable in this real-life drama. Oliver Timothy Campbell is a teen who endures bullying at school, is shy in class and struggles with his first crush. Lacking self-esteem, he tries to run away from his pain and guilt as he grows distant and depressed. Yet through all his problems Ollie never loses his spark of humour. Kamal is Ollie's highly intelligent and quirky best friend who's haunted by the death of his parents. He's a loyal friend who makes Ollie laugh with his antics, with his wealth of words, and his high aspirations. Polly Teasdale is the dream-girl who's confident and compassionate, but only sees Ollie as a friend. Anna Campbell is the fragile, hyper -anxious mother who loses perspective during Lily's illness. In her devotion and self-sacrifice to Lily, although she's kind and caring to the other patients, she isolates herself from her sons. Ben Campbell is the worried and frustrated father who grapples with his stepson Nathan's rebellion, never getting to the root of any of his sons problems. All these characters and more add passion and energy to a drama that climaxes in renewal and healing. Julie Johnston's novel is beautifully written, rich with its kaleidoscope of emotions, and mesmerizing from the first page to the last. I loved "If Everyone Knew Every Plant and Tree" and rate it highly. Julia has come up with an excellent theme here, tackling a difficult subject which, let's face it, can be tricky to deal with - particularly with youngsters. She manages to get right inside a teenager's head, using her clearly natural wit to lighten the mood when called for. You care about the characters and really want it all to work out for them. I liked the horticultural theme which, I guess was rooted in and intertwined the whole story (pun intended!) - and the idea of an 'Emotion Library' r Julia has come up with an excellent theme here, tackling a difficult subject which, let's face it, can be tricky to deal with - particularly with youngsters. She manages to get right inside a teenager's head, using her clearly natural wit to lighten the mood when called for. You care about the characters and really want it all to work out for them. I liked the horticultural theme which, I guess was rooted in and intertwined the whole story (pun intended!) - and the idea of an 'Emotion Library' really appealed to me! This story will strike a chord with all ages for many reasons: it's touching, funny, clever, and has just the right balance of emotions. Still had a little cry at the end, though! So I'd thoroughly recommend this book. I must confess to being a reluctant reader nowadays with far too many other silly things to distract me, but this was really worth the time - and I'm very glad I did..
A must buy book for any age. I couldn't put this book down, warning - don't read this the night before you have to get up early it will keep you reading till you get up! The story is both funny and sad and has great character development and . I will be buying copies for all my friends, as it is a classic book worth owning? I've lent my copy to my sister but can't wait to get it back again to share it with even more people. End of Chapter 2, and I was already fully involved with the Campbell family. I felt a part of them, as though I was sitting in their kitchen with them. A fantastic book, full of both humour and sadness. I wasn't ready to say goodbye to the Campbell's at the end of the story however, so let's hope there's a sequel in the pipeline.....!! Poignant and fast paced, this story is from the point of view of a young teenage boy whose sister suddenly becomes very ill and hospitalized. Oliver was very close to his little sister (who calls him Oliber because she can't quite say his name). He is dealing with normal teenage things at the same time—the beautiful girl that he has a huge crush on, acting in a play at school—while his mother seems to overlook him at best, and find him annoying and inconvenient at worst. The book is charming, and Poignant and fast paced, this story is from the point of view of a young teenage boy whose sister suddenly becomes very ill and hospitalized. Oliver was very close to his little sister (who calls him Oliber because she can't quite say his name). He is dealing with normal teenage things at the same time—the beautiful girl that he has a huge crush on, acting in a play at school—while his mother seems to overlook him at best, and find him annoying and inconvenient at worst. The book is charming, and very funny, and heartbreaking. I loved the relationship between Oliver and his sister Lily. Oliver loves gardening and plants and trees, and brings up the scientific names for them all the time in everyday conversation. Actually, all of Oliver's relationships were wonderful—the conversations between Oliver and his best friend Kamal, and all of his thoughts about them were great, and Oliver's feelings and attempts at charming the lovely Poppy were really funny. Kamal helps by coming up with elaborate plans to win Poppy's heart—not super successfully, lol. One of my top reads for 2018. Really enjoyed the daily angst and humors of the main character. In fact, I cared about all the characters in the book, they were all really well filled out. The book was written brilliantly and cleanly so there was no stumbling around trying to figure out POV or growling over spelling. Top stars! Beautiful book. I could visualise all the characters and felt their emotions. The tears flowed freely especially near the end. If Everyone Knew Every Plant And Tree is a charming coming-of-age tale and the debut novel from writer Julia Johnston. The novel tells of Oliver and the strain put upon his family and friends when his younger sister Lily suffers a long-term sickness. This may sound like morbid subject matter but Johnston fills her novel with bursts of joy and the result is a young adult novel that is both heart-warming and heart-breaking in equal measure. Oliver is a brilliant first-person narrator and Johnston pe If Everyone Knew Every Plant And Tree is a charming coming-of-age tale and the debut novel from writer Julia Johnston. Oliver is a brilliant first-person narrator and Johnston perfectly captures the voice of a 21st century teenager, with references to texting and Facebook and YouTube naturally occurring. Thankfully, Oliver is not the stereotypical troubled teen, which can be a tired stalwart of young adult fiction. Yes, he argues with his parents, gets into trouble and has an unrequited crush on a girl at school, but Johnston creates a much richer character than the average literary teenager. His imagination will often run away with him in fantastic flurries of stream-of-consciousness. At one point, he imagines that his brother will become the first skateboarding priest. Later in the novel, he has ambitions to be the horticultural equivalent to Banksy, planting renegade gardens across London. Oliver enjoys art, discusses music with his grandfather, bags a role in the school production of Hamlet and has a fascination with horticulture (hence the title). All of this means that the novel is peppered with cultural references. Johnston clearly had a lot of fun researching this novel, particularly the scene in the British Art Gallery and the loving description of each painting. Johnson has a fantastic grasp of language and incorporates the titular plants and trees into Oliver’s narrative voice, often with a touch of humour. My personal favourite is the name of the local plant shop, The Fuschia’s Bright, which is a pun that made me smile every time. The supporting cast is large and equally well-drawn. All have bags of personality, whether it be Oliver’s older brothers, his grandparents, the nurse who cares for Lily or his teachers at school. Everyone is handled with care and none are lazily dismissed as background noise. We even manage to sympathise with Oliver’s parents, despite their failed attempts to understand their son. A particular favourite with readers of the novel is Oliver’s best friend Kamal and rightly so. Kamal has his own sad background but brings stacks of energy to every scene, whether it be Shakespearian swear words, rapid-fire dialogue or the odd rhyming poem. The hyperactive Kamal is a great counterpart to Oliver’s more introspective soul and their scenes are always lots of fun. Naturally, there is a serious aspect to the novel considering the story is driven by a young girl’s ongoing sickness. Johnston does not sugar coat this experience for the potentially young readership, choosing to depict the grief, the depression and the hospital scenes in thorough detail. This is a wise move and assumes maturity on the part of her target readership, which will no doubt be appreciated. Like Oliver himself, teenagers do not like to be patronised. As with any coming-of-age story, it is impossible to offer a neat ending because, quite simply, life goes on. I particularly hoped for more closure on Oliver’s relationship with Poppy, which began as an important focus of the story but took a back seat when the family drama intensified. However, there is time to fix that. Oliver’s story has the potential to continue in a series as long and successful as the Adrian Mole books and, happily, Johnston is already working on a sequel. I do voluntary work with teenagers and something that often strikes me about YA fiction is that it often underestimates just how smart and witty young people can be. This book is a great counterexample. The dialogue is spot on. The plot is a heartwrencher (I cried- doesn't happen often! ), but the writing's John Green-esque in that it'll make you laugh as well. I was up til the wee hours reading because I couldn't bear to put it down. A really wonderful book. What a five star read! Such a lovely story! I love this authors writing ! But This was a story about grief and how a family copes! Have tissues handy because there were plenty of times through out the story where the tears just flowed freely... But there is a lot of humor also! I highly recommend this... This story will stay with me for some time ! Well, I read it in a sitting, so I suppose I must have liked it, but don't look for anything groundbreaking. All the characters act out their parts the way you would expect from characters in a book, more than from people in the world, but it is well written, so I do recommend it, if you are feeling up for a story about loss, grief, and family problems. This morning just before I left the house to go to work I received a parcel from Amazon and thought to myself i haven't ordered anything have I? Once id opened the package i was extremely pleases to find id actually won it from the author via goodreads. Wow! A beautiful book , so emotional. The tears were rolling down my cheeks on a French train that I had to put it away until we reached the hotel where I could read without worrying about showing myself up! This book has both sadness & humour. It is beautifully written & the characters are really well crafted & believable. A really good debut novel; looking forward to her next one. When a book wants to take you back to your own adolescence, the years that made you, you let it. I'm glad I found this book. I was underwhelmed. At least we had that one paragraph. I'll always remember that one paragraph. ....maybe. I recently began knocking out the oldest books on my Goodreads TBR, the ones I was still interested in three, four, five years after I first added them. I've forgotten how I came across If Everyone Knew Every Plant and Tree, but now seemed like a good time to check it out, and I must say it was a decent self-published book. It centered around topics such as death and illness, neglect and loneliness, yet still maintained a lighthearted tone and humor that balanced the subject matter out. I adored I recently began knocking out the oldest books on my Goodreads TBR, the ones I was still interested in three, four, five years after I first added them. I've forgotten how I came across If Everyone Knew Every Plant and Tree, but now seemed like a good time to check it out, and I must say it was a decent self-published book. It centered around topics such as death and illness, neglect and loneliness, yet still maintained a lighthearted tone and humor that balanced the subject matter out. I adored Ollie: he was mature in certain ways yet childish in others, in need of his parents but at the age where he was beginning to figure things out for himself, obsessing over the girl of his dreams while dealing with the tragedy of his sister falling ill. His fascination with plantlife added to his charm, Ollie's love for trees and flowers and even weeds fitting nicely into the narrative. I appreciated the author's exploration into various types and stages of grief that accompany the loss of a loved one; no one's pain was the same, each person coping differently, which made for a realistic interpretation. Seeing Ollie deal with that alongside his sense of isolation had my heart aching for him, and something I actually really appreciated was that even at the end, he was still emotionally fragile. There was a good sized cast of characters, some who added to the story—Kamal, for example, who was at times too over-the-top but possessed more depth than I ever expected—and others who made me think they were there mainly to influence Ollie's overall struggle. Whie I liked the way Johnston's book revolved half-siblings and a married couple where one parent had already had kids with someone else, I though Ollie's family situation seemed extreme in how his mother and brothers so easily ganged up on him for the smallest of things. I would have loved to see more of Lilly herself, more of her personality, though the attachment she had to Ollie was precious. I also thought the writing could have been better focused, as it sometimes jumped around too much with not enough transition, and I can't help but wonder what another round of editing might have done to tighten the prose up. I won the book in the Goodreads Giveaway and got a really lovely note from the author. And so I a writing this review for all of you to read. Right into to the second page (in the prologue), this quote stuck with me : "I sometimes think if everyone knew every plants, flower and trees in the world, yeah we'd be experts on plants, but we'd also be experts at describing colour and texture and emotions and stuff... perhaps everything. Life." For some reason, I thought it made sense. Even more so after you read the book... (duh). I just thought it was an original way of introducing emotions and way of dealing with "life" pretty much. I knew from the start that the book targeted a younger audience, but I liked it nonetheless. It's rare that I read books where narrators are boys, even more rare 14 years old boy, so I found it different (nor bad or good), simply different. We are all used to Vampires, Werewolves, Witches and Post-Apocalyptic worlds, so I found it simply refreshing to read a book in the mind of an average 14 years old boy, who's life is pretty singular at first. Then, we see everything unfold before his eyes. Seeing him dealing with real-life events, (whom people can definitely relate with), real emotions and reactions. It made me cry (Yes I admit, I did cry). Ich fand den Beginn des Buchs wunderschön und die Charaktere Oliver, Kamal und Lily sehr sympathisch. Dadurch, dass man aber immer nur Zuschauer diverser Szenen und Unterhaltungen war, konnte ich mich mit Oliver besonders in der zweiten Hälfte der Geschichte nicht gut identifizieren. Die Geschichte an sich ist wirklich herzergreifend und über den Standpunkt des Bruders eines todkranken Mädchens zu lesen fand ich sehr interessant. Besonders an Olivers persönlichem Tiefpunkt, als er das Gefühl hat Ich fand den Beginn des Buchs wunderschön und die Charaktere Oliver, Kamal und Lily sehr sympathisch. Dadurch, dass man aber immer nur Zuschauer diverser Szenen und Unterhaltungen war, konnte ich mich mit Oliver besonders in der zweiten Hälfte der Geschichte nicht gut identifizieren. Besonders an Olivers persönlichem Tiefpunkt, als er das Gefühl hat von allen verlassen worden zu sein, war ich von seinem Schicksal sehr ergriffen. Trotzdem war die emotionale Nähe zu Oliver nicht immer zu spüren und besonders die zweite Hälfte des Buches war dadurch etwas zäh und nicht mehr so mitreißend. Zudem haben auch die Pflanzen-bezogenen Beschreibungen stark nachgelassen, was Olivers Charakter zu Beginn noch sehr stark ausgemacht hat. I received this book from a giveaway. Overall, I think this book was pretty good. It's not your stereotypical sick kid/happy ending book, where everything turns out perfectly. I am actually surprised that I didn't cry at all, considering I am a huge sap. I will admit, I wish we as readers had more "time" to get to know Lily in the book. As a reader, I felt like I understood their relationship and how close they were, but I am not sure I "felt" it. I did enjoy watching Oliver grow and evolve into I received this book from a giveaway. Wow! - I really couldn't put this book down and I have to say it is an inspired piece of writing-thought provoking,funny and very emotional. For a debut book this is as good as it gets...lets hope there's more to follow! Julia studied Music, French and English at A-Level, then French and Drama at Manchester University. After a stint as a secondary school teacher, she pursued an acting career, securing a London agent. She gained an extra qualification to become a teacher for children and students with hearing impairments and worked in London, all the while acting and writing. Her play, 'Touched', which she both acted Julia studied Music, French and English at A-Level, then French and Drama at Manchester University. After a stint as a secondary school teacher, she pursued an acting career, securing a London agent. Her play, 'Touched', which she both acted in and wrote for Edinburgh Fringe Festival, gained acclaim and 5* reviews. 'If Everyone Knew Every Plant and Tree' is Julia's debut novel and she is currently writing a sequel. It has received excellent reviews so far.